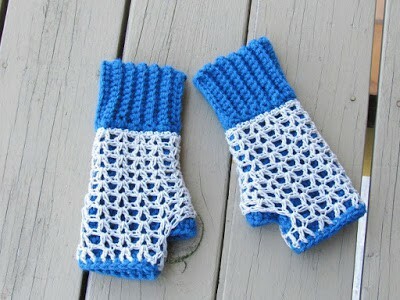 This mittens pattern looks so classy. I love the blue pair so much and would be keeping it for myself. 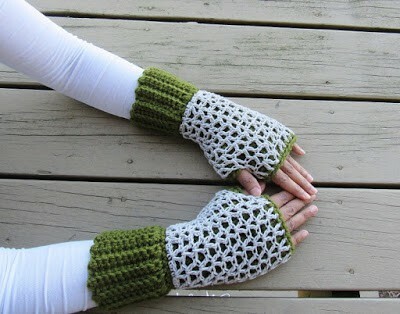 It would make a lovely accessory to flaunt in Fall and also to keep your hands warm in your air-conditioned offices. 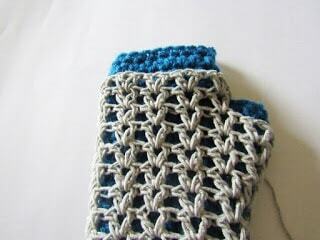 You can make the inner layer dark and the lacy layer a lighter shade or even do the reverse. Either way, this design would look stunning. It is an amazing one skein project that would make a great gift. 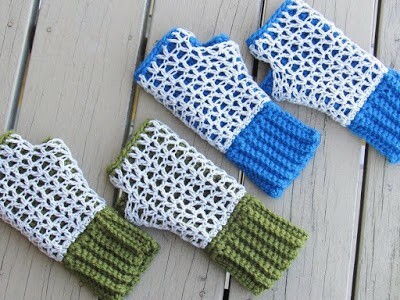 You can make the matching Claire Boots and gift a matching pair. I am sure the recipient would be super excited. The pattern includes lots of pictures of every stage to make it easier. I used Vanna’s choice for the inner layer and Bernat Cotton-ish for the lacy layer. I did get good results using acrylic DK weight yarn for the lacy layer too. 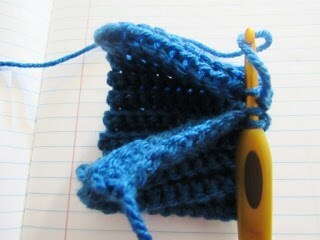 Worsted weight yarn of a soft texture. I used Vanna’s choice. DK weight yarn for the lacy layer. One size to fit women. 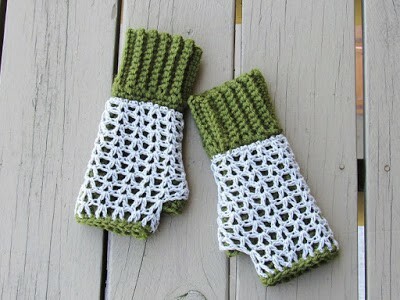 The mittens is 3.5 inches wide at the base and 9 ¼ inches long. 1. Work in Back loops or Front loops only: See the picture below to learn what it means to work into back loops only or front loops only. 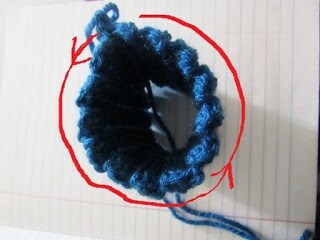 When making a regular stitch the hook is inserted under both the loops as seen in 1st diagram below but inserted only into one of the loops in case you are working into the back or front loops. 2. V- st : (dc, ch 1, dc) worked into the same st.
All the pictures have been given at the bottom of the pattern. Please refer to the pictures when mentioned in the written pattern. With H hook, chain 12. Repeat Row 2 till your work measures 7 inches. Do not stretch your band while measuring. 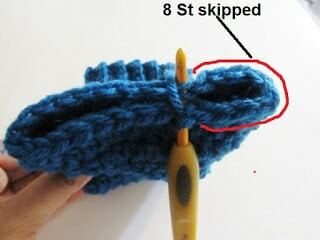 Now slip stitch the two shorter ends together inserting your hook through the front loops of the stitches on your last row and the free loops on the very first row to form a circular band as shown. See Stitch explanation for working in front loops. Now the rest of the mittens will be worked in the round. 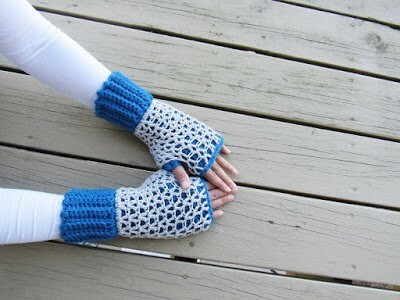 Note: In the next round you will work only into the back loops to leave a round of free loops outside your mittens as shown in. Take care to catch one extra loop behind so that it won’t leave holes in your work. Round 2: Ch 1 ( not counted as a st here and throughout), 1 hdc in the back loop of the same st as ch 1, 1 hdc in back loop of each sc, sl st to first hdc. Do not turn. ——–20 hdc in back loops. Round 14: Ch 1 , 1 sc in next st, 1 sc in each st around ending with a sc in the same st as beginning ch 1, sl st to first sc. Leave a 10-inch tail and fasten off. 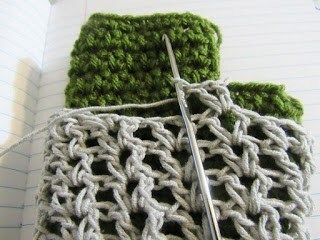 You will unravel this round to attach the lacy layer later. This round is worked just to keep the yarn skein out of your way. ——————-18 sc. 1. V- st : (dc, ch 1, dc) worked into the same st.
2. Instead of doing 3 chains for the beginning dc, (1 sc +2 ch) forms the beginning dc. This keeps the pattern pretty seamless. Lacy Round 1: With DK weight yarn and E hook, at the middle of the inner side of your mitten, insert your hook upwards through the free loop and make a sl st, working over the yarn tail, 2 sc in the same loop as the sl st, *(1 sc in next, 2 sc in next), repeat from * till end, sl st to first sc. Do not turn.——–30 sc. 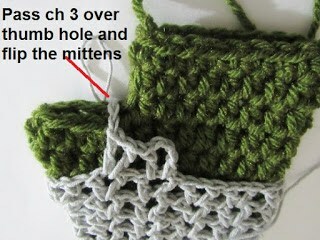 The lacy layer will be little shorter than the inner layer as seen below. 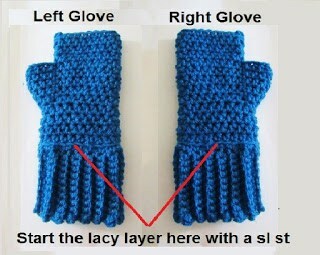 Make sure the increases (extra V-st added) in the lacy layer is aligned along the side of the thumb hole. Unravel the last round of sc of the inner layer, stretch the lacy layer and using H hook and the unraveled yarn, work over the yarn tail of the lacy layer and make a round of sc going through the lacy as well as the inner layer. 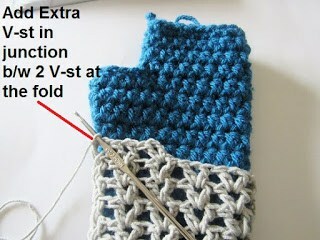 You can work 1 sc in each V-st and one sc in the junction between two V-stitches. 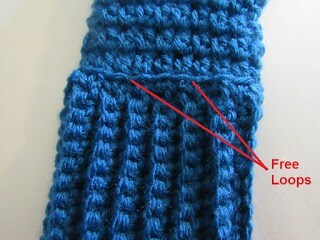 The thumb hole is left unattached to the lacy layer so that the color of the inner layer would peek through it. 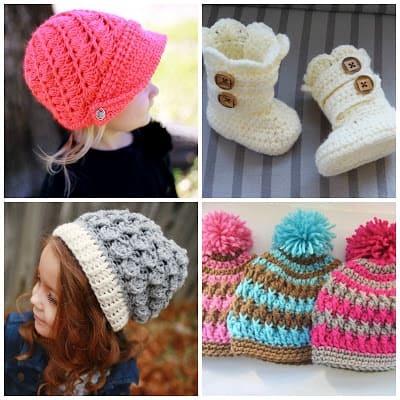 Glad l finally came across an interesting crochet pattern.